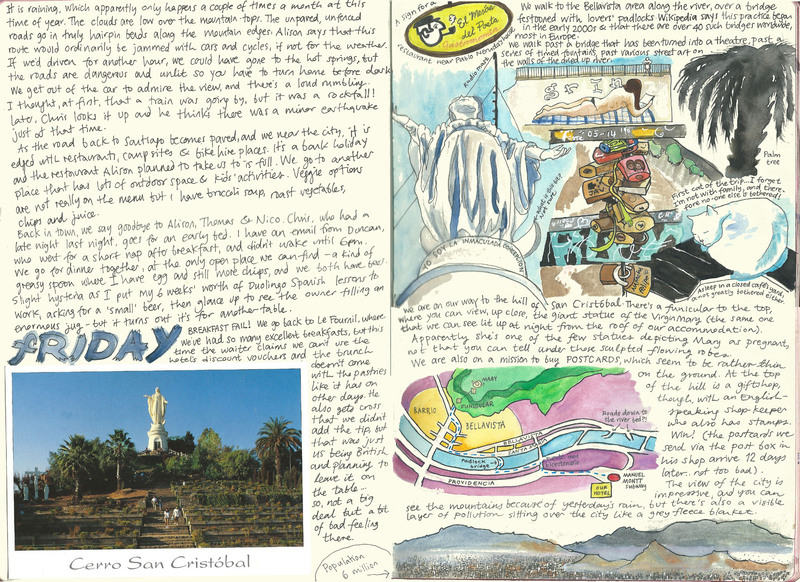 This is part two of my Santiago sketch diary: you can read the first installment here. 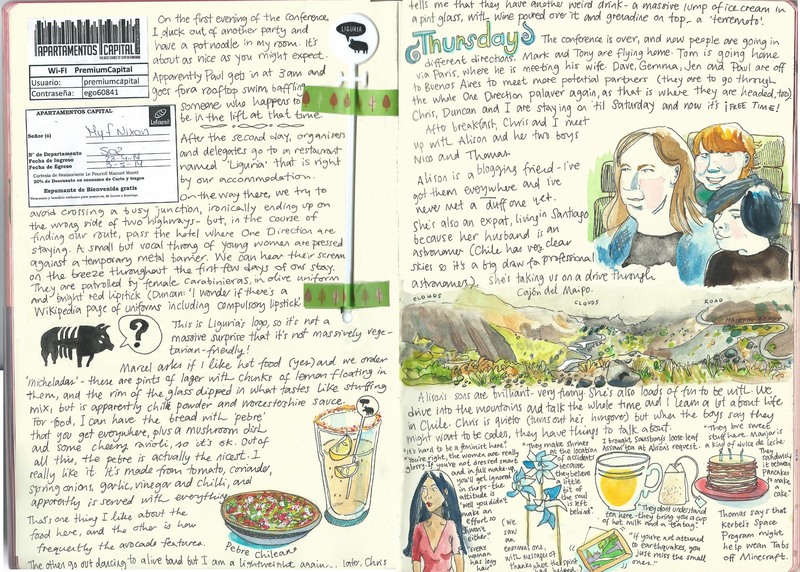 It’s been a busy couple of weeks, but in between invigilating my Open House, attending Brighton festival events, and all the normal duties of job and parenthood, I have been beavering away on the Santiago sketch diary. I’m only two days further on! But that does represent another 4 double spreads, and now there is only the final day (and maybe a ‘wrap up’ page) to complete the whole thing. As always, click on each image to see it at a more readable size. Wednesday night and Thursday: trip to Cajón de Maipo with a very generous contact (and now friend) I made through blogging. This page mentions pebre, which I liked so much I had a go at making at home: I used this recipe. Friday: To the top of San Cristóbal hill, home of the pregnant Mary who oversees the city and can be seen lit up at night. 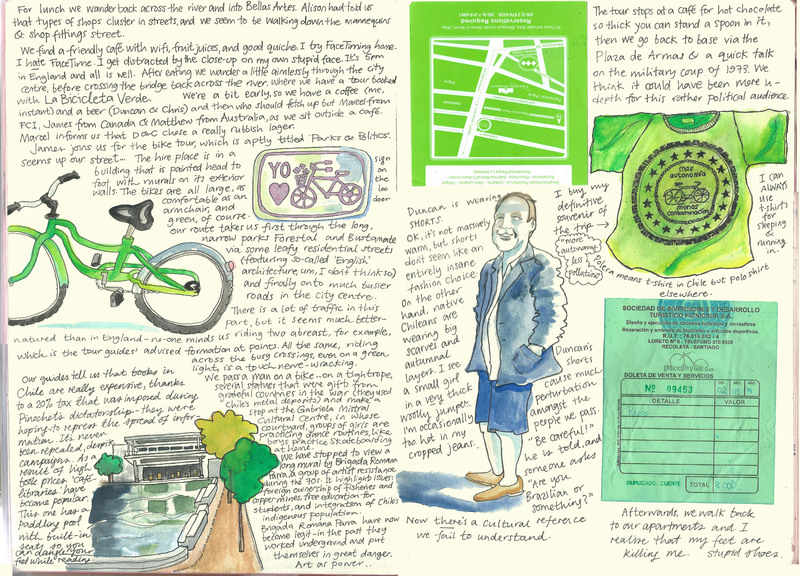 Friday continued: a bicycle tour with La Bicicleta Verde (recommended if you are in Santiago) and the mystery of Duncan’s shorts. Friday evening: visit to the Costanera tower, and a page showing the souvenirs I brought back for loved ones. Update: installment three is here. I love your sketches! Have I said this before? ?